Benny Avecilla was born in Sorsogon, the Philippines, the son of Gregorio Madrid Avecilla and Irene Otano. He was married for 54 years to the late Carmen Deona Avecilla, an engineer, and has five daughters: Lorna, Maryanne, Gail, Lynn, and Sheila. While living in the Philippines, he worked for the Emerito Ramos Corporations as an accountant, office manager, and assistant vice president. Benny immigrated to the U.S. in April of 1977 and ended up in Portland via San Francisco. He worked for the West Coast Marine Co. as an accountant, and later was employed by the St Paul Insurance Company until his retirement. 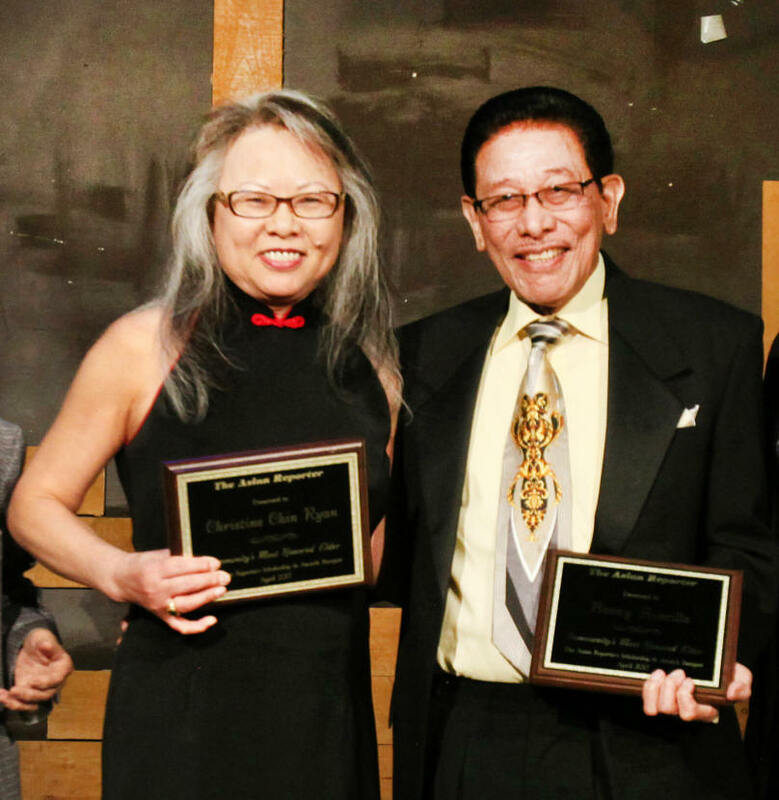 He has been an active member of the Filipino-American Association of Portland & Vicinity since 1980 and served as chairman of the board for three years and president for eight years during his nearly four decades with the organization. He volunteers with St. Ignatius Church as well as the Meals on Wheels program of Loaves & Fishes. He is an avid bowler and organized the Fil-Am bowling league. He currently serves as the international director of the Filipino Canadian American (FilCanAm) Bowling Tournament. Benny has five grandchildren, two step-grandchildren, and one great-granddaughter. Christine Chin Ryan was born in Trinidad and Tobago to Alexander and Ann Chin, their fifth of six children. Her parents had immigrated to Trinidad and Tobago from China and in 1966, the family immigrated to New York City when the U.S. increased the number of immigrants allowed from certain countries, including those in the Caribbean. Christine married her husband, Patrick Ryan, in 1979. They have lived in Oregon for nearly 39 years. Christine has run a small business in the technology industry for 29 years. She is a passionate advocate for small businesses and is also very active in politics. Among her many activities, she is an ambassador for the Asian Pacific American Chamber of Commerce (APACC) of Oregon and Southwest Washington and a member of the City of Portland’s Small Business Minority Evaluator Program (MEP); moderated candidate forums for the Villages at Mount Hood for the past six years; served as a state organizer for the Women’s March on Washington in Oregon in January of this year; volunteered for the presidential campaign of Hillary Clinton; served as secretary for the AAPI Caucus of the Democratic Party of Oregon (DPO) and treasurer of the DPO Environmental Caucus; and more.